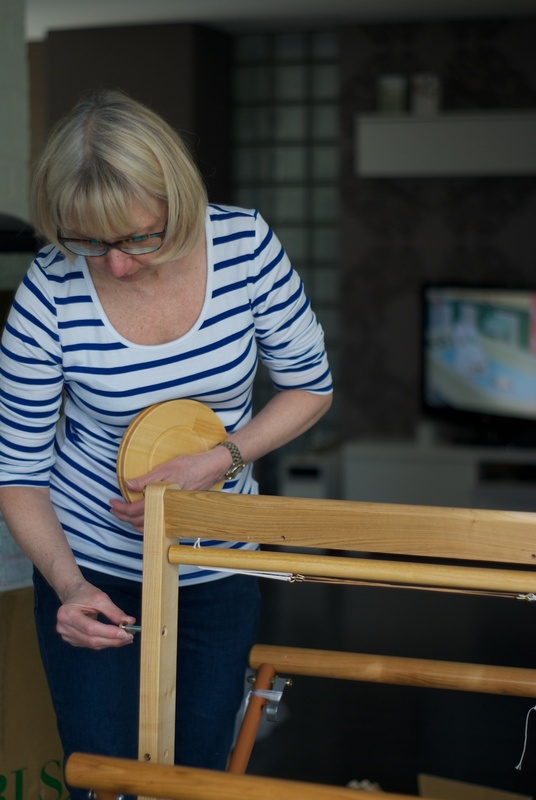 It was great to get out and take a drive down to Pattys house, especially since I knew she had just taken delivery of a brand new Saori loom! Loom assembly party! I was also looking forward to catching some sun in her lovely garden, and Lucca was quite excited about the duck feeding opportunities. 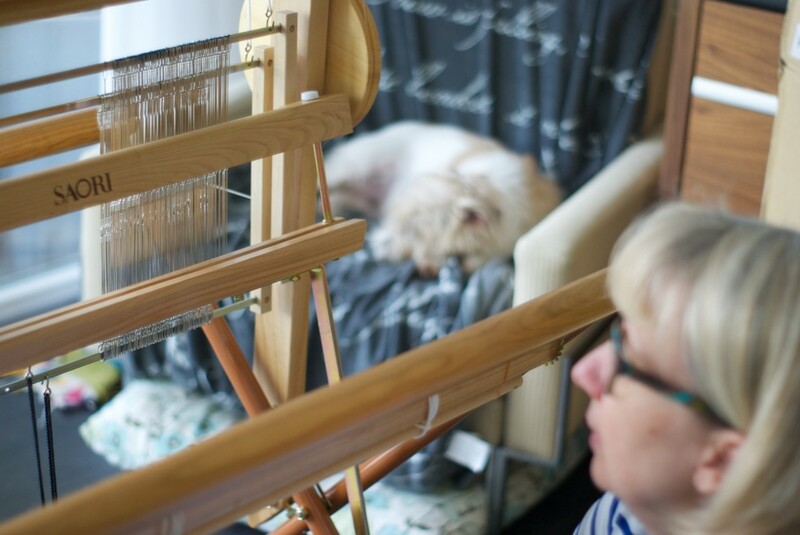 Sally joined us too and after third coffee we got started on the loom. It was something of a brief assembly party, because, apart from Patty undoing first the ONE AND ONLY red tie that was explicity instructed in the manual to NOT to untie first, it all went pretty fast. Sally filled in for RED TIE and held it all together while we dropped in a couple of bolts and tightened everything up and there it was 🙂 A lovely piece of equipment. I am so impressed with the workmanship on these looms, every part of them beautifully made and finished. The goal of Saori is simple, and everyone can use it, and they have totally accomplished this. I really was amazed how fast and easy it assembled. I even had time for fourth coffee before leaving in time to avoid the inevitable traffic jam on the Rotterdam ring. AND there was also christmas in a Saori box for me too, as my comb reed also had arrived! YAY! Of course I had just warped my loom the day BEFORE this so I have to be patient and finish the weaving that I already started before I can swap reeds and have a play with the new one, but it should be really interesting to see what I can achieve with it. 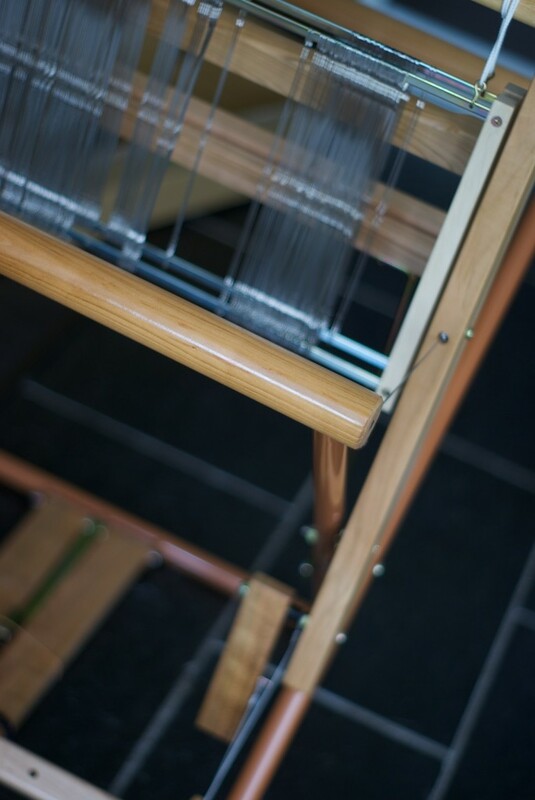 The idea of the comb reed is that the top of it comes off, you can move warp threads around while you weave. I could get in a bit of a tangle but that too could be interesting! 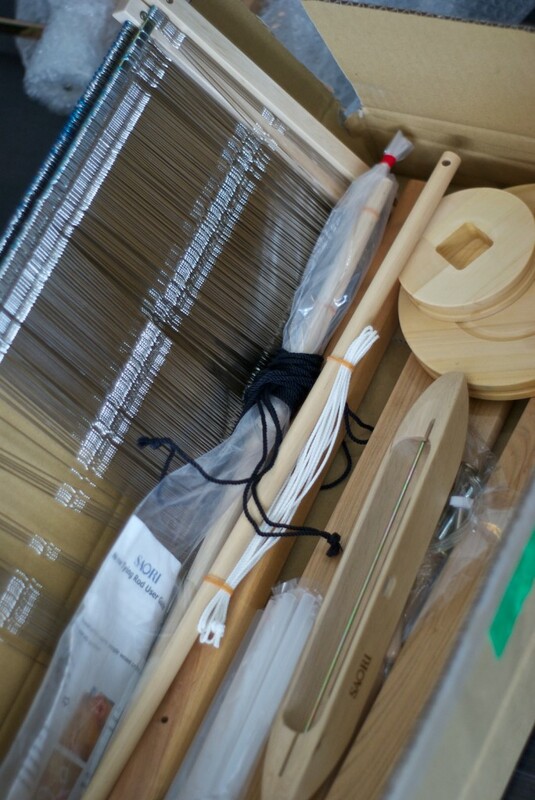 Hi I received my Saori loom recently too. It is truly beautiful! Being six feet tall though we have had to devise a 4 inch height adjustment and it works very well. I love my loom and smile each time I see it! I am sort of new to weaving but this is so liberating and helps distract me from huge pain issues. I plan a weave on apple blossom colours that are just coming in my small garden . 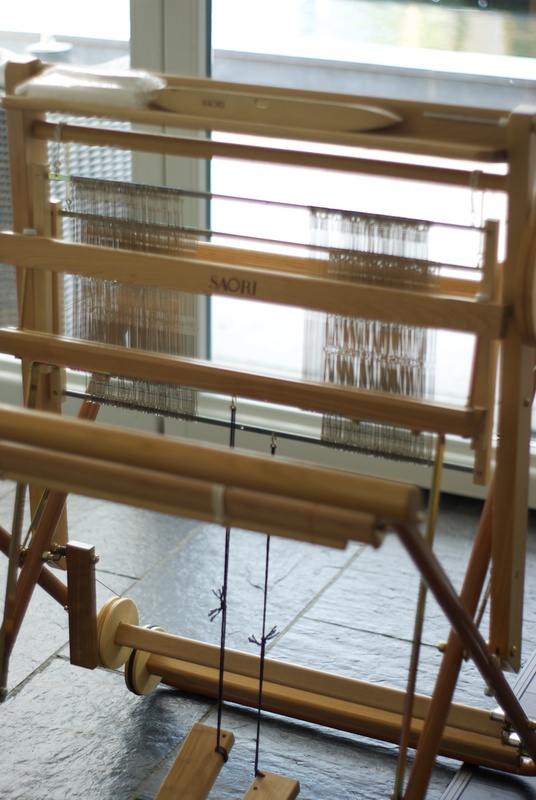 She’s a pretty loom, I call her “Blondie”, She has a much lighter wood than the other Saori looms I have and had in the studio. 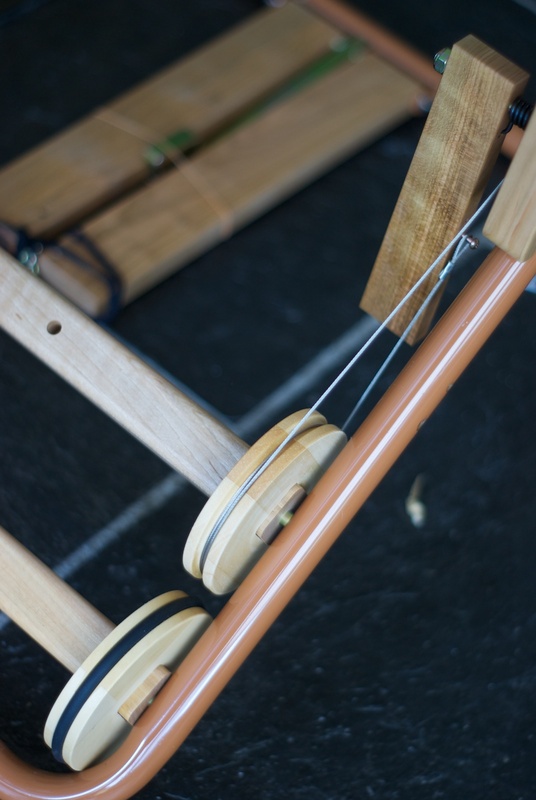 The other interesting thing that I forgot to mention about this particular loom, is that it has two warp beams at the back, so its possible to use two warps together on it, I am looking forward to seeing what Patty does with that! 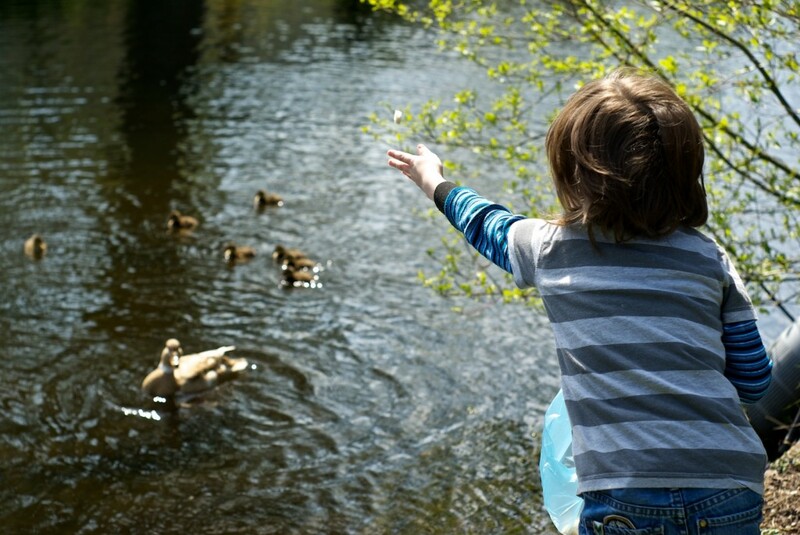 Love the picture of Lucca! yes thats such a cool possibility! On the Majacraft loom it is easy just to slide reed segments around/apart so I wanted to be able to do something like that with the Saori too, now I cant wait to try it 🙂 Just have to clear away lego debris from around the loom. How’d that happen?! No need to wait on the comb reed, you can use it right away if you’d like. You just hang the existing reed off the back (on the warp it won’t hurt, honest) and insert the comb reed into the holder. The reed just kind of hangs out while you play with the comb reed.